The New York Yankees and the New York Mets are in the interesting position of being from the same city, yet they are just as competitive with each other as any two baseball teams are. Indeed, the rivalry between the two is one of the most colorful in the world of baseball, which itself is a sport that certainly isn't lacking in classic rivalries. In fact, the Yankees have been entwined in another age-long rivalry with the Boston Red Sox, although that isn't the subject of this article. Instead we take a look at the more interesting aspects of the two giants of the New York baseball scene: the Yankees and the Met. The New York Yankees hail from the Bronx, and is a member of the American League East Division. The team actually started out in Baltimore as the Orioles in 1901 before moving to New York City in 1903. With the move to New York, the team took on the name “New York Highlanders” before being renamed the "Yankees" in 1913. The New York Mets on the other hand, is based in Queens, and it is a member of the East Division of the National League of Major League Baseball. The team is also known informally as the "Amazins". Some of the best and most recognizable players in baseball were Yankees at some points, including Babe Ruth, Lou Gehrig, Joe DiMaggio, Mickey Mantle, and Yogi Berra. All in all, the team has had 44 players inducted into the Baseball Hall of Fame. Some of the more noteworthy players of the New York Mets are Tom Seaver, Jon Matlack, Darryl Strawberry, and Dwight Gooden, all of whom won the Rookie of the Year award at various times. The team is also notable for Gil Hodges, who won the Manager of the Year award in 1969. Mets pitcher Dwight Gooden also won the Major League Triple Crown in 1985. Over the years, the New York Yankees has racked up an amazing 27 World Series wins in 40 games. The team also has the biggest number of World Series losses. With the exception of the Houston Astros and the Colorado Rockies, the Yankees has also played in World Series matches against every National League winner. Starting out as an expansion team in 1962, few were impressed with the New York Mets’ performance until the team won the World Series in 1969. 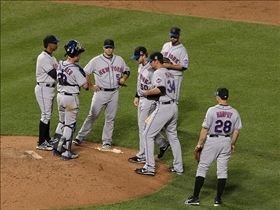 Of all the Major League Baseball teams, the Mets have played the most World Series games. The team won a second World Series championship in 1986. Which NY ball team has more fans? American Baseball vs. Japanese Baseball: What is the difference?